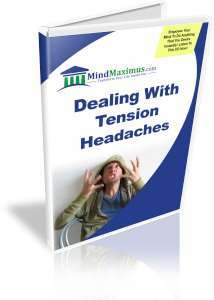 With the increasingly stressful lives we that lead, its no wonder that we are getting tension headaches so often. These headaches drain us of our time and focus, lowering our productivity levels and causing us significant pain and discomfort. Traditionally, we would just pop a few pills to make the headache go away. However, as we rely more and more on such medication, our bodies begin develop a resistance to it, rendering it less and less effective. Over time, the excessive intake of such drugs is also unhealthy for us. Thankfully, with today’s advanced Brainwave technology we are able to reduce the negative effects of stress on our bodies while boosting our natural resistance to tension headaches… all without relying on any medication whatsoever! Do you find yourself suffering from headaches that feel like “having your head clamped in a vice”? Are you having difficulty concentrating on your work because of intermittent headaches? Have you always wished to be able to completely eliminate the headaches that you keep getting once and for all? We are now able to naturally reduce the painful effects of tension headaches, and even gradually eliminate them. Finally, you can get the permanent relief that you’ve been looking for! No reviews on G04 Dealing With Tension Headaches so far.